International departure taxes of $150 are included (subject to change). Today we depart Washington DC for our flight to Mexico City. On arrival, we are met by our Tour Manager/Guide. We proceed to a restaurant near Tepeyac for lunch on our own. We celebrate our welcome Mass at the Shrine of Our Lady of Guadalupe (at one of the chapels). Afterwards, we visit the new and old Basilica, the chapels and the Shrine Museum and Garden. 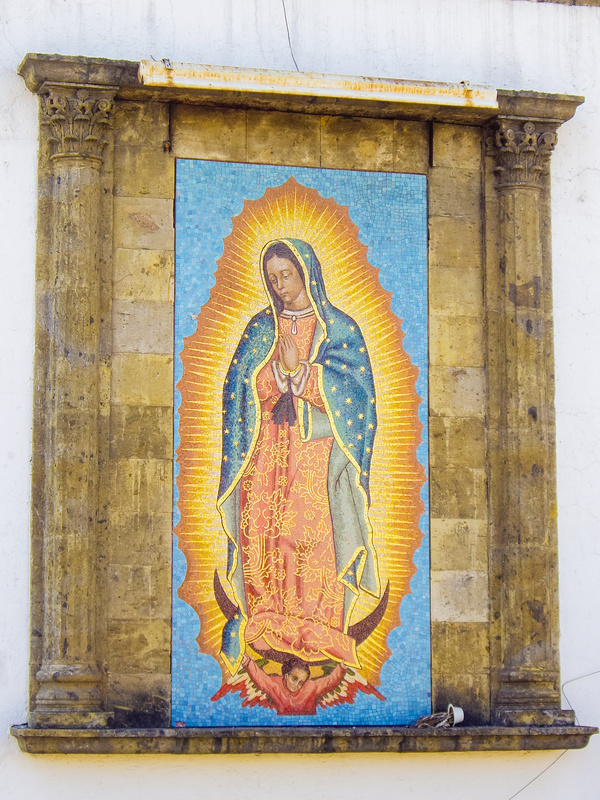 The original tilma of Juan Diego bearing the image of Our Lady of Guadalupe hangs above the main altar of the new basilica and may be viewed at a closer angle on the moving walkway. Lastly, we stop by the gift shops near the Shrine, then transfer to our hotel for dinner and overnight. After breakfast, we return to Our Lady of Guadalupe Shrine and celebrate Mass in one of the chapels of the new basilica. We spend the entire morning at the shrine. We drive through the famous and upscale Lomas and Polanco residences, then proceed to the Anthropology Museum in Chapultepec Park with its impressive collections of archaeological and anthropological artifacts from prehispanic Mayan civilizations. We continue to the Zocalo, the main plaza in Mexico City. We visit the Metropolitan Cathedral, the largest and oldest cathedral in Latin America. Nearby is the impressive National Palace, home to the offices of the president of Mexico and the Federal Treasury. Before returning to our hotel, we stop by the Garibaldi Square to see the Mariachi Bands, then proceed to La Parrillita restaurant or similar for dinner on our own. Overnight at our hotel. This morning, after breakfast, we journey to Tlaxcala and the colonial city of Puebla. Along the way, we see the breathtaking views of the Popocatteptl and Iztaccihuatl volcanoes. We celebrate Mass at the stunning Basilica of Our Lady of Ocotlan, known as the “Lourdes of Mexico. Above the main altar is the miraculous wooden statue of the Blessed Mother discovered inside a tree by the Franciscans after the apparition. We visit the Capilla del Pocito which houses the healing well. We proceed to the Church of San Miguel de Milagro, built in honor of St. Michael who appeared during an epidemic in 1631. After a panoramic tour of Puebla, we enjoy lunch on own. We continue to the Cathedral and the exquisite Rosary Chapel in the Church of Santo Domingo. We return to Mexico City via Cholula. Dinner and overnight at our hotel. This morning we transfer to the airport in Mexico City for our return journey to the USA.